Have a favorite restaurant or bar you love in Federal Hill? Each wood panel is hand-painted on by Artist Linda Amtmann. These are painted on tongue & grove floor boards. Collect more than one and they interlock to create your own neighborhood. We have many favorite places throughout the Federal Hill neighborhood. Each wood panel is sold individually. 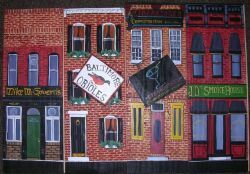 Hand painted Federal Hill Rowhouse wood panels are available in various choices including some famous Federal Hill landmarks: The 8x10, Abbey Burger Bistro, Blue Moon 2, Captain Larry's, Cross Street Market (Circa 1970's), Cross Street Market (today), Cowboys & Rednecks, Crazy Lil's, Delia Foley's, Don't Know? Tavern, Mad River Bar & Grill, MaGerk's Pup, McFaul's, Metropolitan, Mother's Federal Hill Grill, Nevin's Pub, No Way Jose Cafe, Nobles, Pickles Pub, Porter's, Pub Dog, Regi's American Bistro, Federal Hill Reserve, Ropewalk Tavern, Ryleigh's Oyster, The Rowhouse Grille, Social Pub & Pie, Sliders Bar & Grille, Spoon's, Stalking Horse, Thirsty Dog Pub, The Hill.